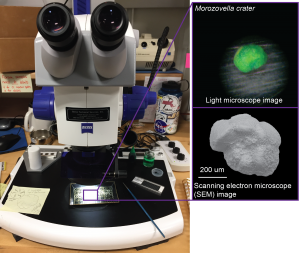 Adriane Lam from University of Massachusetts, Amherst, chats about why she swapped a paintbrush for planktic, foraminifera. Ever since I was in high school, I dreamed of going to college to obtain a degree in art. There was nothing more inspiring than creating my own works of art on canvas, using vibrant colors and abstract shapes. As I got older and wiser to the world, I knew art was not a feasible career. Not knowing what my path in life might be, I started my post-high school education at my local community college. It was there, after taking two geology classes, that I knew I wanted a career in the geosciences. Growing up in the country as a kid, I always collected rocks, fossils, and other natural curiosities, so it made sense that I should go into a science field. After community college, I obtained a BS and MS in the geosciences, with a focus on paleontology. Currently, I am a PhD candidate at the University of Massachusetts Amherst, where I teach classes, conduct research, and enjoy hiking in the beautiful mountains that surround my college town. The tool I can’t live without and use daily? A paintbrush. At my university, and for my PhD, I am learning to specialize in planktic foraminifera biostratigraphy. Planktic foraminifera are very tiny (the larger ones are about the size of a grain of sand) single-celled protists that float at the top of the water column in all oceans. They create a shell, made of the same material as seashells at the beach are made of, which is very distinct for different species. 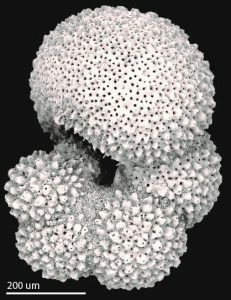 When the foraminifera (foram for short) dies, its shell sinks to the bottom of the ocean, where it is covered with other materials (mostly clay, other shells, etc.) and preserved. Through time, different species of forams evolve and go extinct. Because the foram shells preserve so well, the extinction and evolution of foram species can be seen throughout the rock record. These events have been dated, or calibrated, to geologic time by other scientists throughout the years, so that some species of foram are very useful for telling time. The field of paleontology in which scientists use fossils to tell how old the sediment is is called biostratigraphy. I was lucky enough to have been chosen to sail on IODP’s current expedition, Expedition 371, in the Tasman Sea as a planktic foraminiferal biostratigrapher. 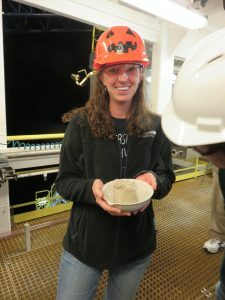 Every scientist’s role on the ship is vastly important, but the first thing everyone wants to know as sediment cores are being drilled and brought onto the ship is how old the sediment cores are. Because this task is so important, there are currently 9 paleontologists sailing on the ship who work with different types of fossils. There’s an entire process we go through when a core is brought on the ship to obtain the fossils, but here I’ll focus on how the planktic forams are extracted from the sediment and rock we drill into, and how we tell age from fossils. The first thing that happens when a core is pulled up onto the core deck is that an announcement is made, such as ‘Core on deck!’ I then put on a hard hat and safety glasses and grab a bowl to collect the core catcher (the end piece of the core that literally keeps the sediment in the pipe as the core is brought back to the surface) sample. The core catcher sample is the last section of the core that is given to the paleontologists to analyze for age. The technicians bring the core from the drill floor to the core deck, where the core is cut into sections. While the core is being cut, another technician is given the core catcher to disassemble, remove the sediment, and give to the paleontologist. Once I have the sample, I take it back inside to process. If the sediment is very soft, I simply rinse it over a screen to remove small particles. But recently, the sediment we are recovering has been very hard. In this case, the core catcher sample is cut into thin slices using a rock saw, then small pieces are shaved off of a slice using a sharp-edged tool. These smaller pieces are crushed with a mortar and pestle for a few minutes. The sediment is then rinsed over two screens: a 2 millimeter screen to hold back the larger particles, and a smaller screen to catch the microfossils, and a larger screen to hold back the larger rock pieces. The rock pieces are then crushed again until there is enough particles in the smaller screen to analyze for planktic foraminifera. The sediment, which we call the residue at this point, is then put into filter paper on a stand to drain out the extra water. The filter paper and residue are then put onto a hot plate to dry. After the residue is dry, it is put into a small plastic bag with a label indicating exactly where it came from within each core. At this point, the residue is ready for analysis! At my desk, I have a microscope, a small tray, very small paintbrushes for picking very small fossils, a jar of water, and green food dye. Because the microfossils that I look at are made of calcite, they are very bright under the lights in the microscope. Dying the fossils a green color cuts down on the reflectance of light off the foram’s shells, and enables me to see the details of the fossil necessary to identify it to the species level. There are usually a lot of different planktic foraminiferal species in each sample, but there are only a few that I usually look for that tell me about the age of the sediment. These are called ‘marker species’. When I find a marker species, or when a marker species suddenly disappears, I have a chart that I use to look up when that speciation or extinction event happened. Once I have an age estimate for the residue sample I’m looking at, I write this information on a big white board in the paleontology lab. All of the other scientists look at this board frequently to determine the age of the sediment that is being brought up. The entire process is repeated for every core that is drilled, but surprisingly, I haven’t gotten tired of it (yet)! Every core we drill is unique and contains scientific information that is useful to the objectives of our expedition, and sometimes, we never know what we’re going to drill into! Aequilateralis: Globigerinella aequilateralis, one of my favorite planktic foraminifera species, found at one of our first drill locations. Even though this foram is large compared to other species, it is still very small. Image was taken with a scanning electron microscope (SEM). Sediment_processing: In the first image, the technicians are bringing the core that has just been brought onto the ship onto the core deck. While 4-6 people wipe off, measure, and cut the core into sections, another person disassembles the core catcher and removes the sediment that is inside (center image). In this photo, the sediment is relatively hard, or lithified. When the core catcher sample has been removed and measured, part of it is given to the paleontologists so we can do biostratigraphy (right image). Sediment_processing2: Left image: the core catcher sample that was obtained here was cut into thin slices. One of these slices is then cut into smaller pieces using a small tool (center image). The smaller pieces are then crushed into finer grains using a mortar and pestle (right image). Surprisingly, most of the tiny fossils survive this process! Sediment_processing3: In the left image, the pulverized sample is rinsed over a screen several times. Once there is enough sediment, at this point called the residue, to work with, it is put into a paper filter to dry (center image). When most of the water has dripped out, the filter paper and wet residue is then placed on a hot plate to dry (right image). Paleo_board: The white board in the paleontology lab is very important, as it is constantly updated with the age of the core catcher samples that we look at. The left column is the sample number, the nanno zones correspond to calcareous nannofossil ages, the ‘benthic’ and ‘planktic’ columns refer to the two types of foraminifera, and the ‘rads’ column corresponds to radiolarian ages. All the scientists are always busy working with their samples or writing reports, thus the ‘Paleo lab deadlines’ section!